In order to compile and run the web application, you would need Java (>=1.6) and Maven 3. If you want to run the example you can go to the Deployment section of this post. 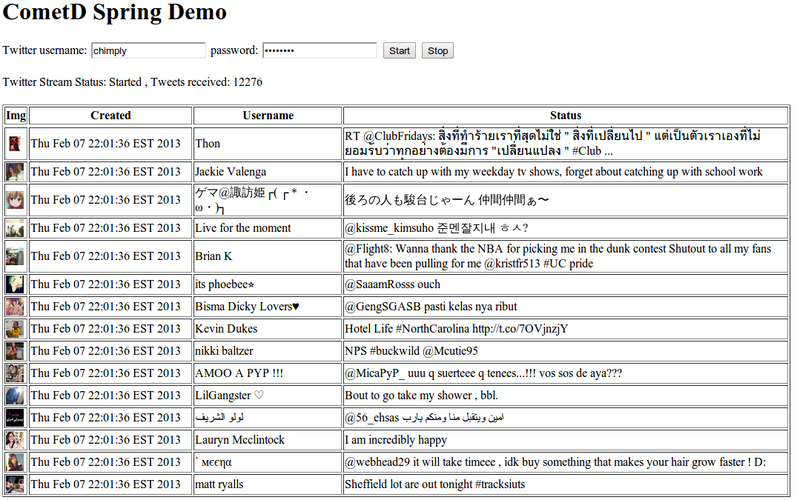 To access the Twitter streaming API, we are using the twitter4j library. $ curl -u <TWITTER USERNAME>:<TWITTER PASSWORD> "https://stream.twitter.com/1.1/statuses/sample.json"
In this class, we define a method to start listening to the sample streaming and publish the statuses to the cometd channel and one method to stop listening. They will be called by the ViewController. On the web page, you can enter your twitter username and password and press start. You should see a list of status showing on the web page. You can stop receiving the list of statuses by clicking on stop. You can also open multiple browsers on the same URL and see each of them receiving the same data. We have shown in this tutorial how to publish data to the browser. We have not shown how to publish data to a particular client. It can be for example to update in real time the balance of a user’s account or in a chat application to send private messages. You can look at this tutorial to see how to do that. You may come across some issues while integrating cometd to your web applications. Also make sure that your web.xml is using the version 3.0. Make sure that you are not instantiating the class CometConfigurer in your spring servlet xml file. thanks chimp, your articles really help my project!